Tofu Dessert also known as dofu hua is a classic Chinese dessert that's topped with a sweet ginger syrup. 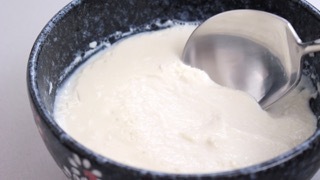 Large pieces of silky tofu that are itself sweet, are served cold in a bowl. Sometimes you can also find this delightful treat at dim sum restaurants. I recommend making this dessert using your own homemade soy milk (I also have a recipe for Soy Milk if you need it). If you don't have the time or energy to prepare the soy milk yourself, make sure to purchase fresh soy milk with no additional additives or ingredients (only soybeans, water and sugar). Your best bet would be a local Asian supermarket. 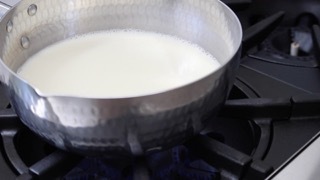 Tip: When using store bought soy milk (depending on the brand) you may need to gently boil the milk longer to let some of the water evaporate. Store bought milk can often times be diluted with additional water. 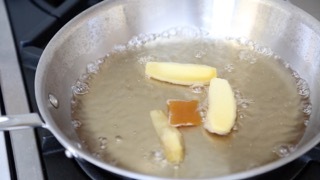 Cook Time = 10 min. 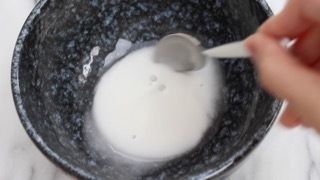 * don't forget to pour the soy milk from about 1 foot above the bowl containing the gypsum powder. 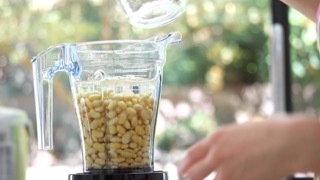 This will ensure everything mixes in well and smoothly without stirring.